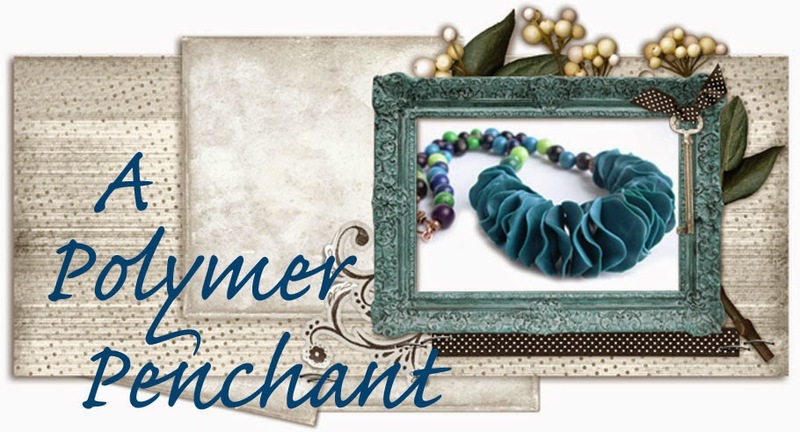 A Polymer Penchant: Bead Soup Blog Party reveal! My goodness! So many participants this time! I love each and every piece you made! The beads you received were clearly inspirational and you did creative, wonderful things with them! I'd like to pick some favorites, but don't think it's possible. I really liked each one! What glorious shades of blue you got to work with -- and I'm really impressed with how seamlessly you incorporated your own polymer work into the beads your partner sent. This was truly a creative partnership! And I look forward to seeing the other pieces as they are completed. You've been such a busy bee, or should I call you busy butterfly? I love everything you made: each piece is unique and gorgeous in its own way. The soup you received was gorgeous to start with, and you did it justice. Gorgeous pieces, I really love how you incorporated the clay with the dagger beads to make flowers. Love the touch of green from the cording too. I am amazed by your creative vision. Each piece is so lovely and unique. I love them all. I'm definitely following. Maybe some of your genius will rub off on me. Wonderful designs! I am in total awe of your butterfly necklace. Amazing creations. The butterfly necklace is so original. But my favorite is the last necklace. I love the flowers. Gorgeous. Love The butterfly it is so original and so well done. Love what you did with the dagger beads too :-). The butterfly is beautiful, but yeah, I'm a sucker for daisy chains. I love these pieces! I love what you have done with the dagger beads - both the earrings and the flower necklace. Please enter me in the giveaway - I love those peony beads. Great soup and you made beautiful things with it. Go you! Gorgeous pieces! Love the butterfly necklace, so inventive to put the components together like that! I love all your unique and gorgeous jewelry. I want that first pair of earrings with the daggers and polymer clay focals...spectacular! The butterfly is outstanding too. Please enter me in the giveaway. I shared this on google and twitter as well. Your designs are all gorgeous, but that last necklace with the flowers is absolutely a work of art. It's amazing! All your designs are great! I love the butterfly piece, and how you created flowers from the daggers. Thanks for the giveaway! I tweeted your blog post as well! Love the butterfly....love the flowers! Gorgeous pieces. Especially I like the bird earrings and the flower necklace. The butterfly necklace is amazing, I love the wy you used the clasp. Beautiful creations, Emma! Love each of them, but I think my favorite is the last necklace. Emma your designs are outstanding. The lampworked bead in the first bracelet really shines against the blue chips. Both pair of earrings are cute. The birds talking to each other made me think of a life experience I had. Your butterfly is wonderful and it sure spotlights that gorgeous clasp. The daggers make great flower petals. I would not have thought of using clay for the center. Thanx for the inspiration. I may have to try that. It is very generous of you to have a bead giveaway. Thanx for the chance to win some beautiful beads. Look at all those blues!!!! What a gorgeous soup you were sent! I am partial to lapis but the necklace tassel you created with that faceted teardrop took my breath away. I am really enjoying all the different techniques I am seeing in individual pieces and you have such a great sense of style and design. And that butterfly focal, my goodness, that is clever and beautiful! I had to laugh at your comment about it being a miracle you remembered which side to put the clasp on, I struggle with this and often have to undo work so it isn't awkward to take on and off, lol. I would be honored to create with the items you are offering in your give-away, thank you for the opportunity and please count me in! Thank you for visiting my party post! So many beautiful pieces combined and so very lovely for this time of year. Emma I tweeted about your bead giveaway. I love all the creations! And what a creative way to make a butterfly necklace! Just gorgeous! It looks to me like you were right on-time with your creations! I love your butterfly!..and what a great way to use dagger beads to form an earring! Perfect! Lovely work, all around! Lovely earrings with daggers... and I love the most the necklace with blue long focal, green cord and several cutely pretty daisies made with dagger beads. Awesome! Absolutely breathtaking pieces, my dear ! Love the first two set of earrings ! Beautiful pieces! Wonderful and different from each other. I especially like the last necklace - what a statement piece! I love your creations, especially the dagger flowers, they're stunning! The bird earrings are really sweet too! I wonder what they're talking about? Beautiful work! The two necklaces are both very charming! Great! I thought what you did with the clasp was really creative and loved those little bird earrings but then I scrolled down and saw the necklace you made with the daggers and I am overwhelmed. It is so cool, pretty and kind of edgy at the same time. Will you be selling it? Your pieces are simply amazing. You mix polymer and beads and so many techniques in such an interesting and personal way that I could not choose a favorite. They're all beautiful. You've created some beautiful pieces with your soup. I love how you were so creative with your drop shaped focal bead and the daggers stones on the spring inspired necklace, simple yet bold - Cheers! You created some awesome pieces. I love the colors and how you pulled them all together and the number of pieces you did make. Very nice! Thanks for the giveaway also! Soup-er creative! Truly unique pieces. Blown away by the butterfly! Blue is not at all my color, but your pieces make me smile! Your first bracelet is so fun and I know I would totally wear it! Opalite is one of my favorites so, I can't help but love your blossoming peony earrings—your polymer flowers are too sweet. And oh wow! what a fabulous way to keep that stunning clasp front and center in the butterfly necklace. I thought you were done amazing me… and then your daisy necklace—so delicate and also bold in details. So yeah, blue and I don't get along well, but I so love everything you made—you made that blue shine in amazing ways!! Love the blue color scheme and your designs. Great job! WOW just WOW I love what you did with the daggers how super cool are they!! All of your designs are stunning! Let's see... where to start!! Love the birdie earrings! And the way you used the clasp was so creative! And that spring necklace looks like so much fun! Great job! Those earrings! Wow!!! Mind blown...and then i scroll down to see how you made flowers out of those daggers!!! Already blown mind blown again! Hats off, Emma!! This is jaw dropping gorgeous! Emma, I love those earrings they are so unusual I like those peony beads. The spring daisy necklaces is charming you have made stunning use of your soup, and I would love to be included in your giveaway, thank you. I amazed at what you did with your soup. Looking at it I did not see butterflies and flowers. I enjoyed reading how each piece was created. I am truly in AWE of your talent. Your butterfly necklace is outstanding, not only did you think of that idea but were able to execute it admirable. I love those dagger flowers and sprinkled slog the cord just makes me think of daisies in a field. the way you altered the stacking on your wee bird earrings I bet half the viewers never notice they are opposing. I do that a lot with my own earrings but not the ones i make for sale . I guess i feel that most folks wont get it. I'm so glad i stopped by again, was sad you hadn't posted Saturday but you're forgiven , such a feast for the eyes. Love the cute little birds earrings ... love all the pieces you made with your soup! I love all of your pieces. I especially like the earrings that you made. They are all very creative. Congrats on a job well done! wow, very clever designs...i would NEVER have thought to do what you did. love looking at everything. the flower necklace is my fav! Beautiful creations. I love the blues and the necklace. I love your soup and the pieces you created with it are amazing. The colors are beautiful - I love love love blue. Absolutely in love with your treatment of the daggers into flowers, so soft and feminine. Love the designs! Awesome work. That second piece is a stunner! Thanks for the oppportunity to win a taste of your soup. By the way also impressed that you were able to get the list up, blogger would not let me do it no mater how I tried, lol. I was smiling as I read your blog and looked at your designs, and then I saw it..My favorite design of the entire challenge. You "dagger" flower necklace. It is amazing. I love it!!! Love the bracelet - the gumball bead just makes the whole piece pop. Your designs are very creative and unique. All your pieces are beautiful, but I especially love the daisies in the last one - wonderful! Love the butterfly theme and what you did with the dagger beads, beady awesomeness! Charming soup, Emma! The last necklace is a stunner - such an eyecatch, beautiful work! (attempt to comment #3, user errors) Beautiful work. The idea to create a butterfly with the clasp and large nuggets is inspired. And I really love how you incorporated your polymer clay work into the designs. Following your blog so I won't miss what you do with the rest of your soup. Wow - all your designs were stunning! I agree that the dagger beads really matched the polymer flowers well in your earrings. I loved the creativity in the labradorite butterfly necklace! And I thought the daisy chain was gorgeous - it could have been made from real flowers! What an inspiration! I love how you worked with the beautiful blues, that color would have been a challenge to me. It's great how you incorporated your polymer skills into the pieces. I especially love the butterfly necklace and the insect look earrings. ...and I forgot to mention, I already follow you, have been for about 8 months. It's very nice you're offering a giveaway. Beautiful pieces - I particularly like the first pair of earrings where the dagger beads look like wings and the last necklace with the "daisy" flowers. So cute! Stunning pieces...i never know what to do with the daggers and you tackled that beautifully. I really like the daisy piece! And the peony beads (charms?). VERY pretty! Crappity-crap, lost my novel when I clicked to go back to look at something....but, briefly....soup envy!! I have been wholly enamored of moonstone for the last several months, and have been completely unable to find any nice pieces that are large enough to see without a microscope; and there it is..all in your soup! And you did it proud! That butterfly necklace is amazingly creative, and I adore both sets of earrings...beautiful work! Oh my goodness, so much lovely eye candy! I especially love the whimsical daisy necklace! Brings to mind a summer day playing the "Loves me, Loves me not" game with the petals! I really love your designs. The butterfly probably the most but the last one that looks like daisies is amazing as well!!! the one with the drop pendant is wonderful, and I love the earrings too!!! Great Job! Have a Blessed Day! Absolutely love the blue bracelet, I would love to wear that, All your pieces are so well designed, the flower necklace stunning, the birdie earrings so cute, and the butterfly-beautiful! Oh my. That blue/flower necklace is my favourite. That stone was used wonderfully. Great job. Everything looks great. The flowers you made from the dagger beads...genius! That necklace is my favorite piece. I also really like the blue bracelet. Nice job! Love the asymmetrical bird earrings! Then the show stopper at the end was AMAZING!!! I love how you used the daggers to make a whole flower and also made the smaller bud profile piece. So did I understand correctly- you embedded the dagger beads into polymer clay forming a shank button?! Brilliant!!! Absolutely brilliant! It turned out absolutely beautifully. This is a wonderful post, each creation is so beautiful - I love the butterfly necklace and those earrings are so gorgeous, but it was the daisy necklace who brought me here from Pinterest! I guess it is so springy, I can't help it! Love what you created and really love the shades of blue! WOW I LOVE LOVE LOVE Everything you made! Great stuff! Aren't you clever making Daggers into flowers. I love the Dagger flowers, green/blue combo and Long length of this piece, simply beautiful. That butterfly is gorgeous! Mad inspiration here! Lovely work. The colours are gorgeous. Lovely last necklace. Green and blue work perfect toguether and the flowers give it so lovely air. I think I love that last necklace! And what a super clever way to use the chunky nuggets and clasp on your other necklace. I would never have thought of using them that way, but as soon as I saw your design I knew it was a perfect use of those components. Greatly done! Oh! I love those dragonflies earrings (that's the first thought I had when I saw the picture), and flowers you made! The last necklace is simply stunning! I cannot begin to express how much I LOVE that necklace you made with the focal. It's exquisite! Love the flower necklace! Looks like you were out picking flowers and instead of making a crown you draped them around your neck, very sweet. I'm now following you on Pinterest, FB and subscribed to emails (some or all are under my real name Selfridge instead of Rhose-my author name), plus this comment. Is that four entries to pl/artists!ay? I love winning things and supporting other bloggers. Oh- drat- I meant to say I followed some under my real name, Selfridge, (vs. my author name Rhose). Beautiful designs! - I especially love the daisy chain necklace - my favorite. I also really love your use of silvers and blues paired with the opalescent beads. Your designs are very summery and fresh, they remind me of a prairie. I also like the wings you designed - beautiful. I think it is interesting that your designs have the little hints/suggestion of winged creatures/beetles - butterflies. I really love the Daisy necklace! When I first saw your soup, I thought the piece with the clasp would wow me the most. It did wow me, the but the Daisy necklace has the retro 70's made modern vibe that I just LOVE. It is so on trend! And the green just makes it. LOVE! Brilliant work! Your butterfly necklace is gorgeous! How clever to turn that clasp into a focal - and what a beautiful focal it is too. Loving the birds earrings as well - really cute! Great work. Innovative and fresh. Must say I'm partial to the flowers necklace. Just lovely. Gorgeous soup ... and you did a gorgeous job with it!! Oh what a wonderful giveaway... I'd love to have a chance to play with those goodies!! I love everything you made, Emma! I can't pick a favorite but if forced i'd say the butterfly necklace wins but the other necklace, the earrings and bracelet are also wonderful. Great use of soup and lovely soup you sent your partner, On my way there now. I came for CC7A but I may as well comment here, Emma :) I am slooowly making my way through BSBP but hadn't made it "up" to yours yet. This may confuse me LOL. These are just brilliant, girl. I was needing a little blue inspiration as I am about to embark on Ocean 2014 and it is 100% blue! Your butterfly, well, what can I say, I love butterflies and this guy is awesome :) You are so clever! The daisy is very Euro-hippy, I love that one also. OK like I said Love them ALL and now I am starting to babble so time to say goodbye! The first necklace is my favorite, but those earrings are just wonderful. I would love to win that soup! I would say you were cooking up a storm! I totally love the first piece. I would never, never, never have thought to make a solid color bracelet with one focal bead....how creative...I will have to file that away to remember in the future. You make a great soup...my hat off to the chef! I love what you made! And I am crazy about your polymer clay pieces! You did a beautiful job with your bead soup! Thank You for the chance to win this little prize what a great treat this would be for anyone !!! I am also following you now. Very nice blog!!! The butterfly was quite inspired, and your use of the daggers was absolute perfection. Excellent results from a nice soup!!! And the long necklace with the dagger flower makes me smile. Lovely work. And I crave your prize!!! I've wanted some of your amazing polymer pieces for a while. I love those earrings! I like them both, but in particular I love those little birdies having a conversation. And your long necklace with the dagger beads wire together into flowers makes me smile. Lovely work. And I crave your polymer prize! I've been in love with your work for a while, but am too poor to buy. Lovely, Emma! I really like the two pairs of earrings, and also the necklace with the dagger flowers (to me they look like daisies). Beautiful beads - I would love to win them! Those are some gorgeous soups!! Well, with over 100 comments, I know I have a slim chance on winning, but please toss my name in as well. I simply adore your creative genius girl! Love, love, love the butterfly wings! And I'm so glad you explained the process on the dagger flowers, they are so seriously cool! I don't really do asymmetrical, but those birdie earrings might make me try, they are just cute! Well done dear!! Love how you used that beautiful clasp! it made a wonderful butterfly! As usual you create such lovely pieces. I especially like the bluebird earrings but all of them are dazzling. Gorgeous pieces, I too love the earrings and also the necklace that looks like you made daisies out of the beads. I would be most honored to be chosen for th giveaway! What pretty pieces. Love what you did with the clasp. The beads you made and added on to the soup designs were as impressive as the actual soup you were sent. I really love the shades of blue and your designs are beautiful! Oh, your designs are simply divine. Your butterfly necklace made me swoon a little as soon as I scrolled down to it. It really is spectacular. It blew me away. Awesome, awesome work! Even though the chips bracelet is my favorite because I just can't resist the colors, I have to admit how impressed I am with the expert "construction" of the focal-clasp - this necklace is unique! And the polymer clay shank flower buttons you made using the daggers - brilliant!